If you suffer from allergies you need a hypoallergenic laundry detergent to keep you feeling clean and comfortable. Find out what brands are available, and which are recommendeded here in this ultimate guide. There are many brands of detergent available, generally called "free and clear" or something similar to that, which are designed for those who suffer from allergies. As explained in more detail in my article about laundry detergent allergy symptoms and relief what most people are allergic to in detergents are the scents and dyes. Therefore, for some people almost any brand of detergent that is free of these ingredients will work well for them. However, some people have additional allergies which make one detergent, even a free and clear one, work better for them than others. Unfortunately, this can involve some trial and error to find a detergent that works for you. There are many brands available for those wishing to have a scent and dye free detergent. Here is a list of the available products in alphabetical order, plus reviews of them provided by readers, where available. Not all of these are available for purchase online, but when they are I've linked the image to a place you can purchase them, if you want. You can read information about Ajax laundry detergent here. Most of these versions of this brand are not scent free, but they do make a scent free liquid which will work in both HE and non-HE machines. One if its main advantages is that it is a very low cost brand, although some people have complained about its cleaning power in general. I've gotten a positive review of the Ajax free and clear detergent here. You can read information about All detergent here. This hypoallergenic brand is available in both a 2x concentrated version, and also a "small and mighty" version which is 3x concentrated, along with a powder. Plus, it is also now available in laundry pacs. I've gotten a couple of positive review of All Free and Clear detergent, saying it did well with their allergies (including my own positive review). The mighty pacs also did quite well. I will caution, however, that ALL came out with a free and clear version of the All Oxi Active. Unfortunately, I've now gotten several reviews saying that All Free & Clear Oxi Active caused an allergic reaction. Therefore, at this time I recommend the orginal version, not the new one with the Oxi stain fighters. This brand really wants to be known for its hypoallergenic versions, and has also now come out with a version which is called ALL Fresh & Sensitive, which is dye free. It is still billed as for those with sensitive skin, but does have a scent. Click the link for my review of it (I didn't like it because of the scent, which makes it not hypoallergenic in my personal opinion). Arm & Hammer has both its regular detergent in a hypoallergenic laundry detergent version without perfumes and dyes. You can read more information about Arm & Hammer detergent here. You can also read a reviews of Arm & Hammer Perfume & Dye Free Detergent here, which are mixed. For instance, one reader found it helped relieve the constant cough her son experienced because of allergies to a different detergent, while others who used it for years all of a sudden startd developing an allergy to it, perhaps from a new formulation. In addition, Arm & Hammer has an interesting version of detergent called "sensitive skin plus" which is supposed to be for those with sensitive skin, but it still has a scent. It is called "skin-friendly fresh scent." I'm not really sure I would classify this as an allergy-free laundry detergent, but it somewhat fits into the category so I thought I would mention it. I haven't gotten a review of this specific type of detergent yet, so if you've tried it I'd love to know what you think. This is a detergent formulated to wash baby clothes, although it could easily be used to wash adults clothing as well. Further, it is an eco-friendly laundry product. I don't currently have a review of this product, so I'd love it if someone would share a review with me here. This detergent is for babies, but can also be used on everyone's clothing. It is also a natural laundry detergent. I have received a positive review from a reader about Babyganics detergent here. However, the reader mentioned the detergent, although it says it is unscented, has a light scent. Since it says on the package "fragrance free" I would be interested in hearing if others also thought it had a scent, or not. This detergent is three times concentrated, and is an eco-friendly laundry detergent. It comes in both the liquid version (shown on the left), and also in powder (shown on the right). I don't currently have any reviews of the free and clear version, so I'd love it if someone would share a review with me here. Charlie's Soap is actually a detergent, not a soap, but it is more eco-friendly than many other detergents on the market today. In addition, it does not contain a scent, making it a hypoallergenic laundry detergent. Many people use it for washing diapers and their own clothes when they don't want the added smells many detergents leave behind. You can learn more about Charlie's Soap here. In addition, here are some positive reviews of Charlie's Soap laundry powder I've received from readers. You can read more information about Cheer laundry detergent here. In addition, I've shared my own review of it here, and also received a couple of reader reviews of Cheer Free and Gentle laundry detergent here. Please note that recently Cheer discontinued the powdered version of their free and gentle detergent, and now only the liquid version is still available, in either regular or HE version. In addition, I've had one complaint that the HE version caused an allergic reaction, so check out the reviews in the link above. In addition to being free of perfumes and dyes, this detergent is also natural. Unfortunately, I received a Green Works Laundry Detergent Free & Clear Review from a reader which reported that it still caused her son to break out in hives, so clearly it is not a hypoallergenic laundry detergent for everyone. Dapple is a brand made entirely for baby products, but it should wash adult clothing just as well. It is also a green detergent. I don't have any reviews of this brand yet, so please share your review here if you've used it, to share your experience. In addition, I've personally reviewed the scent + dye free version here, which worked well for cleaning lightly soiled clothes, but didn't work well on stained clothing. You can read more information about Dynamo laundry detergent here. This version of the detergent has gotten a bad review from a reader. You can read this Dynamo detergent review here. This is an all natural laundry detergent. You can read more information about Ecos laundry detergent here. There is both an adult and baby version available. In addition, they have recently also introduced pods. I don't currently have any reviews of the free and clear versions of this brand, so I'd love it if someone would share a review with me here. You can read more information about Era laundry detergent here. In addition, I've gotten a couple of reviews of Era Free detergent here, which were mainly positive, although I personally tried it and it gave me an allergic reaction. This is a green company, and it has created scent and dye free laundry pacs. They are dual compatible, meaning they will work in both HE and standard washing machines. The Honest Company is a relatively new brand that is eco-friendly. Both the liquid and pod version of their detergent are scent free. I've gotten mixed reviews of this brand, with one positive review, and another reporting an allergic reaction to the pods. You can check out the Honest laundry detergent reviews here. The Laundress is a high-end brand of laundry products, and they've introduced an unscnted version of their detergent. I have not received any reviews of this product, so if you've used it I would love for you to share your review with me here. Martha Stewart Clean is a laundry detergent made by, you guessed it, Martha Stewart. It is perfume free, as well as eco-friendly. 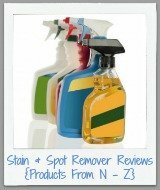 Unfortunately, Consumer Reports has stated it does not actually work well to remove stains. You can read the review and watch the video here. This is an eco-friendly detergent, as well as hypoallergenic. You can read more information about Method laundry detergent here. In addition, I've received a several reviews of Method free and clear detergent here. Further, I got another review saying that both the scented, and the unscented, seemed to irritate her family's skin. Mrs. Meyer's brand is known for being aromatherapeutic, so I alays thought it was strange that it had a scent free version. I guess it wasn't very popular though, since the unscented version has been discontinued. Their detergent comes in both powder and pac varieties (which they call nuggets). Here's a couple reviews of these products, which are positive. The Planet brand is relatively new brand of environmentally friendly products, all of which are scent free and labeled as hypoallergenic. They have both an HE liquid detergent (pictured on the left), a regular liquid detergent (not pictured), a powdered detergent (shown on the right) which can be used in both HE and non-HE washers, and finally they also have a delicate wash (not pictured). I haven't received any reviews of these products yet so if you've used one I'd love for you to share your review here. This detergent comes in a free and clear version liquid version (there is no powder), one containing Zout stain remover, and also in 3 in 1 laundry sheets, which are for the washing machine, as detergent and fabric softener, and then that you throw into the dryer as a dryer sheet too. In addition, Purex has just added new Ultra Packs, which include free and clear scent as well. You can read more information about Purex laundry detergent here. I've gotten mixed reviews of this detergent here on my site. You can read all the Purex Free & Clear laundry detergent reviews here, but I'll say I also tried this detergent and found it worked pretty well. In addition, you can read my review of the free and clear version of Purex Complete with Zout here, and several Ultra Packs reviews here. Finally, I haven't actually gotten any reviews specifically about the free and clear version of the 3 in 1 laundry sheets, but I've gotten enough bad reviews of them in general (see link for details) that I don't recommend you use them. This is also a natural laundry detergent, and it is available in the free and clear scent in both liquid and powder, and most recently in detergent packs. You can read more information about Seventh Generation laundry detergent here. In addition, several readers have provided positive reviews of Seventh Generation Free & Clear detergent here (including me!) However, I've also gotten one review where someone had an allergic reaction when using the detergent. Kroger Home Sense brand, which I personally tried but didn't like for lack of cleaning power. Kirkland Brand Laundry Soap Free & Clear Scent From Costco Reviews - Mixed reviews, with several people loving it, and others saying it caused an allergic reaction. Because I've gotten so many reviews (here's a second page of Costco laundry detergent reviews since I got so many) saying it caused rashes and other allergy issues I don't recommend this one. There is a free and clear version of this lower-cost laundry detergent. You can learn more, in general, about Sun laundry detergent here. I've gotten two reviews of this product, and unfortunately both people shared that they had an allergic reaction to it. This is an eco-friendly laundry detergent, along with it being free of dyes and perfumes. Several readers have sent in reviews of Sun & Earth laundry detergent, explaining how it worked for them, with their sensitive skin and allergies. This detergent comes in both liquid and powder versions. You can read more information about Tide detergent, in general, here. There have been mixed reviews about this hypoallergenic laundry detergent on this website from readers. You can read these Tide free and gentle detergent reviews here. Basically, one person (my family to be exact) has had no allergy problems with it while a couple of other readers did. Until very recently Wisk did not have a hypoallergenic laundry detergent option, but they've recently released one. This product is advertised as free of both perfumes and dyes. You can read information about Wisk laundry detergent here. Here are reviews of Wisk Free & Pure Deep Clean laundry detergent, where both I and another reader were quite positive about how it worked. 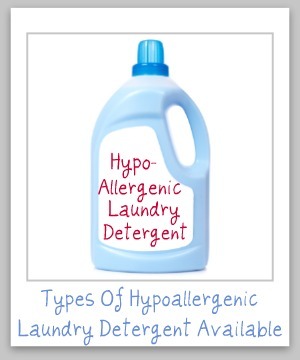 What Is Your Favorite Hypoallergenic Laundry Detergent? 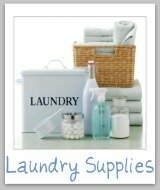 I would love to hear from you about what detergents work well for you and your laundry allergies. You can share your reviews here. 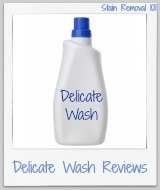 I will feature your reviews on this page, along with my list of available products, to allow everyone to find a hypoallergenic laundry detergent that works well for them. 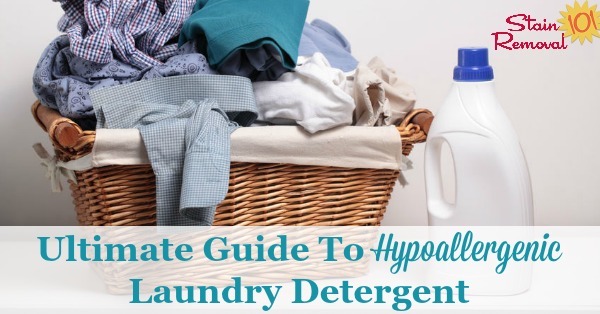 Don't Forget To Use Hypoallergenic Fabric Softener & Dryer Sheets Too! If you go to all the trouble to find an allergy free laundry detergent, you should not ruin all your good efforts by then adding back scents and dyes into your laundry with fabric softeners and dryer sheets. Fortunately, there are lots of brands available which can suit your needs. 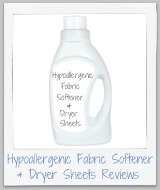 If you're interested, I've compiled a similar list of hypoallergenic fabric softener and dryer sheets you can reference! Hope you enjoy it.